This glorious tart balances juicy berries, rich cream and crisp almond pastry in delicious harmony. 1. For the pastry, whizz the almonds, flour, cinnamon, sugar and a pinch of salt in a food processor, until combined. Pulse in the butter until it resembles breadcrumbs. Whizz in 2 tbsp iced water until it comes together into a ball. Tip onto the work surface, shape into a disc with floured hands and wrap in cling fi lm. Chill for 1 hour. 2. Preheat the oven to 180˚C, gas mark 4; put a large flat baking sheet into the oven to heat up. 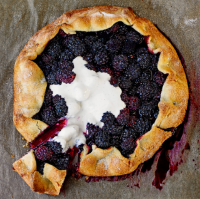 Toss the blackberries with the cornflour, sugar, lemon juice, ½ tsp vanilla bean paste and a pinch of salt (add more sugar to taste, if liked). 3. Roll the pastry out between 2 sheets of baking parchment to a 30cm circle, 0.3cm thick. Lift off the top sheet and pile the fruit in the middle of the pastry, leaving a 5cm border. Bring the pastry edges up around the fruit, leaving a gap in the middle. Brush the pastry rim with egg and scatter over the 1 tbsp sugar. 4. Slide the galette, on its parchment, onto the hot baking sheet. Bake for 30-35 minutes, until the pastry is golden and the fruit is jammy. Take out of the oven and cool for 5 minutes. Mix the cream and remaining ½ tsp vanilla, and dollop over to serve.